The area’s top high school athletes faced off last weekend, competing in the 24th Annual U.S. Army Hispanic Games, sponsored by Berkeley College at The Armory’s New Balance Track and Field Center in Washington Heights, NY. During the event, Berkeley College and the Armory Foundation recognized 11 high school athletes with the Leaders of Tomorrow award, honoring their achievements in academics and athletics, as well as their contributions to the Hispanic community. Watch the Highlights: Click here to watch a video from the U.S. Army Hispanic Games. 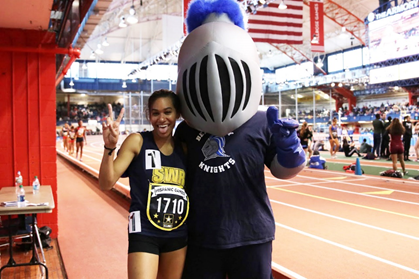 Photo Captions: (Top) Sir Berkeley, the Berkeley College mascot, poses with Katherine Lee of Shoreham-Wading River High School, winner of the Women’s 1-Mile Invitational, during the U.S. Army Hispanic Games at The Armory’s New Balance Track and Field Center in Washington Heights, NY. (Above) Michael J. Smith, President of Berkeley College (third from left); and Rita Finkel, Co-President and Director, Armory College Prep (right), congratulate the Leaders of Tomorrow award recipients during the U.S. Army Hispanic Games at The Armory’s New Balance Track and Field Center in Washington Heights, NY. The U.S. Army Hispanic Games were founded as a way to honor the Hispanic culture of Washington Heights, NY. More than 5,000 athletes from high schools across the tristate area competed. During the event, President Smith and the Berkeley College mascot, Sir Berkeley, held the finish line tape for the Women’s 1-Mile Invitational. On January 19 and 20, 2018, Berkeley College will sponsor the New Balance Games at the Armory. In March, Berkeley College associates will compete in the 2018 Armory NYC Indoor Marathon team relay, which supports The Armory Foundation in its mission to promote fitness and education through athletic, educational and community programs. Photo Caption: Sir Berkeley, the Berkeley College mascot, fires the starting gun for the Women’s 1-Mile Invitational during the U.S. Army Hispanic Games at The Armory’s New Balance Track and Field Center in Washington Heights, NY.